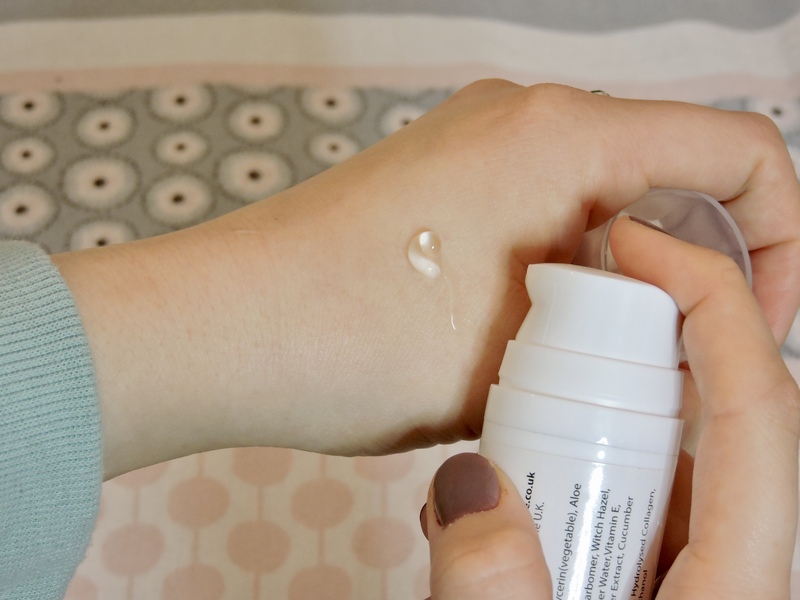 Today’s post is sponsored by eyewake as they very kindly sent me* their eye wake collagen gel for your eyes and I am so excited to let you guys know my thoughts on it. FIRSTLY, THE GREAT THING ABOUT THIS IS THAT EVERY EYEWAKE PRODUCT SOLD A DONATION IS MADE TO HELP VICTIMS OF DOMESTIC VIOLENCE. 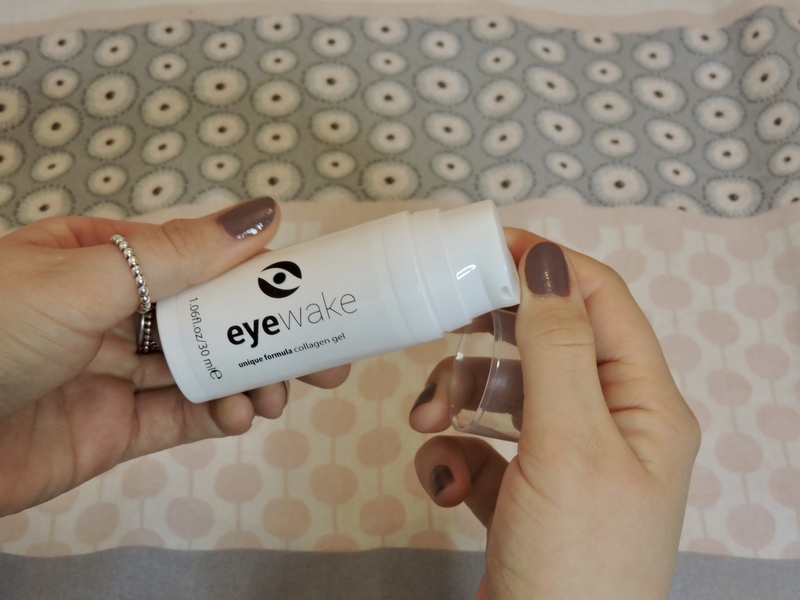 eyewake is a natural collagen gel for under your eyes that is said to remove dark circles and help with puffy eyes. It helps with anti-aging and helps to revitalise your skin. It has 30ml of product inside, which isn’t bad at all and it doesn’t have a smell to it. So this is the packaging of the bottle that it comes in. It has a clear lid and a little nozzle that you push down so the product can come out. I like using products with a nozzle because it is quick and easy and also, you aren’t putting your fingers inside to get the product out which is good because it means there will be no bacteria. I do think that the packaging looks “cheap” without sounding rude, because the product itself is EXTREMELY good, I do think that the packaging could be a bit better. It comes in a white plastic bottle, with the label of everything you need to know such as the name, how to use it and whats inside it, around the bottle. This is what the liquid comes out looking like. It is clear and has a really different formula to anything I have used before. It is really thick, but as soon as you rub it in it almost turns to a watery consistency. It starts to turn really lightweight, but still feels heavy on the eyes which is what I want. I like having thicker eye products around my eyes because I feel like it helps that area a bit more. When you put it on the eyes, you can definitely feel a thick layer of it but then it softly absorbs into the skin. It is such a good gel for the eye area, it has helped me so much (especially In the mornings) regarding my puffy and dark eyes. This is such an essential for you if you have really early mornings and you find that your eye area struggles a bit. I also love that it gives my eye area an extra boost when I need it, I know I can turn to this and it will help my eye area out instantly. It makes my skin look and feel more healthy. It brightens my eye area up and brings life back to my skin when I use it. I definitely notice a difference when I use and then apply makeup, in comparison to if I don’t use it and apply makeup. It really changes the way my eye area looks. I like that the formula isn’t hard to work with. It is a great consistency and it isn’t sticky at all, once you rub it on your eyes and if you have any let over on your fingers it almost turns to a water consistency and basically disappears. I like that it doesn’t have a scent, not everything has to have a scent. I don’t really have any wrinkles so I can’t talk for the anti-aging side, but might as well start young and use products that are meant for anti-aging right? I really like this product. I think it does my skin a lot of good and I don’t think I could not have this in my skincare routine anymore. I tend to go to bed really late and have early mornings so this is the perfect thing for me. It is essentially what coffee does for you, but a gel that does it for your eyes instead. What do you think about this product, is the sort of thing you are looking for / need? It is really good! Would recommend it! By the sounds of this, I definitely need to try it out! I have a feeling my under eye area will love it.